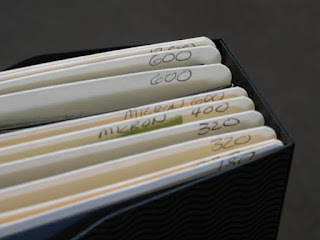 If you're like me, then organization in the studio is something that you need, desire and lust after, and that only happens when you can finally conjure some time to tackle it - in other words, set aside the million items screaming for attention on your to do list for an hour and procrastinate with something else. Not that organizing isn't a worthy activity. Lack of organization - searching everywhere and repetitively for the same supplies lost in the labyrinth of cupboards and boxes, over and over again - just eats up time in a very noticeable way. But it tends to take a back burner to more urgent, money making activities, like making jewelry. Even though a lack of organization adds to the time it takes to make something, thus costing more minutes of labor tacked on to every task. Not so this week! Ha ha! I finally tackled a project that has been devouring time for a couple of years. I emptied my sandpaper boxes and reorganized them into a filing system. So simple. So alphabetical. So easy to find my sandpaper - and back stock that I forgot I had (i.e., couldn't find in the studio mess). My solution? I found these simple manila folders that are closed on three sides, called file jackets. They fit into a handy open top file box and I can label each folder with the grit. Plus keeping them separated prevents cross contamination - in other words, I'm not getting 220 grit bits on my 320 grit papers from unauthorized canoodling in the bin. The jackets have an advantage over the open folders in that I can put in left over small pieces too - they're still good, handy for polishing and won't fall out of the folders. It was so simple. 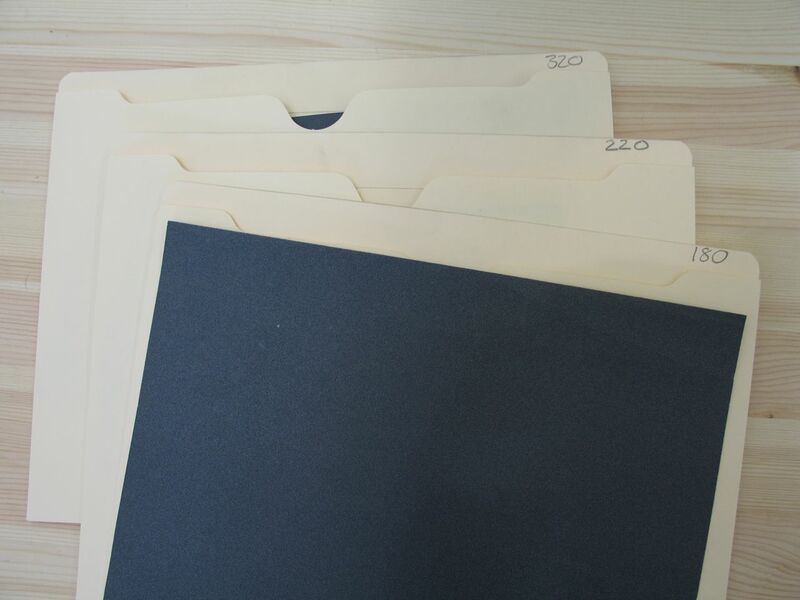 Sandpaper is letter paper size, so it fits perfectly into these folders. There are even pocket folders available that expand to 1" wide or more for popular grits. And it didn't take very long to do. In fact, I was so inspired, I jumped into the deep end of the procrastination pond and reorganized my metal cabinet using the same filing system. 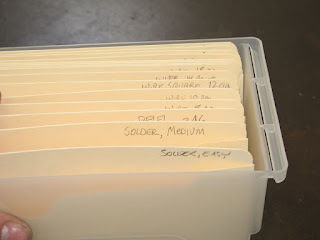 My metal has been hard to sort through, and made filling kits for classes a deja vu nightmare rerun. Gee, am I trying to say, that I was searching for the same metal every couple of weeks? Yup. Not any more! Type of metal on the left. Form of metal on the right. 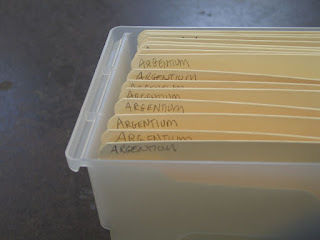 So, I alphabetize it first by metal (argentium, brass, copper, etc. ), then by form (sheet, solder, wire), and then by gauge or other pertinent sub-information. Of course, if you can read my writing in the photo, you can see it's still a bit of a jumble alphabetically in the bins, but that's the beauty of it! If I just keep up with part of it, like all the sterling is in the same place, then I can still quickly flip through the folders and find what I'm looking for. And again, the folders help to prevent scratches, loss, etc. Even better - because my metal now has an obvious home to go back to, it stays organized. My rule for organizing: if it has a home to go to, it's easier to get organized. If not, it sort of drifts around the bench, counters and cupboards with no clear destination. My previous systems for this? Up-cycled film canisters for wire, sheet, sterling, etc. but everything inside was a stack of bits and pieces and had to be resorted/found by gauge over and over. Once it's filed in this bin system, then I know metal, form and gauge. My other system? Binders with sheet protectors or plastic pockets. Which had the advantage of being able to be seen through the plastic sheets and flipped through, but the heavy metal just ate up even the heaviest weight sheets. Want an even prettier system? 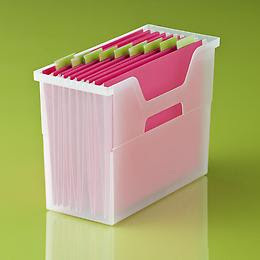 Try these folders and boxes from the Container Store. 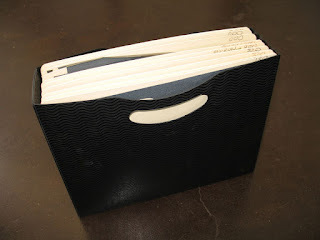 Although, I'd still use the file jackets to keep my metal from falling out and into the bottom of the box. For big pieces of metal (6x12), I use legal size file jackets and a matching file box. My 12x12" plates still have to sit in the cupboard. Just too big, but I suppose I could use a scrapbook folder or box to hold those too.... Off to the next project! Hope this helps to inspire your studio organization projects. Please share your solutions. Brilliant idea. Left me smacking my forehead - so simple, so effective. Thank you for sharing your organizational ideas! !